BleachBit deletes junk to recover disk space and maintain privacy. It rids your system of old junk including cache, Internet history, temporary files, unused locale files (better than localepurge), logs, and cookies. Designed for Linux systems, it wipes clean 50 applications including Adobe Reader, Bash, Firefox, Flash, OpenOffice.org, Opera, Real Player, Skype, and more. It shreds files so that they cannot be recovered, and it wipes free disk space to hide insecurely deleted files. It offers both a simple PyGTK GUI and a command line interface for automation. BleachBit has many useful features designed to help you easily clean your computer to free space and maintain privacy. * Simple operation: read the descriptions, check the boxes you want, click preview, and click delete. * Translated to 37 languages: Arabic, Asturian, Belarusian, Brazilian Portuguese, Bulgarian, Catalan, Chinese, Croatian, Czech, Danish, Dutch, Faroese, Finnish, French, Galician, German, Hebrew, Hindi, Hungarian, Indonesian, Italian, Japanese, Korean, Low German, Malay, Norwegian, Polish, Portuguese, Romanian, Russian, Serbian, Slovak, Slovenian, Spanish, Tamil, Thai and Turkish. 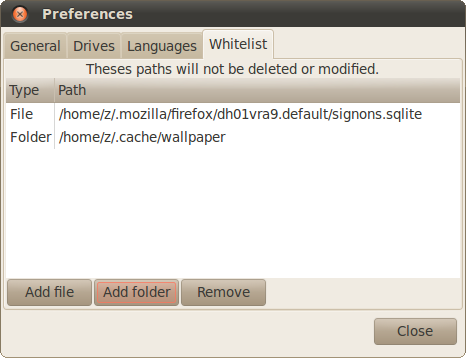 * Add whitelisting feature, so certain files and folders are not modified. Setup your whitelist in the preferences dialog. The whitelist feature supports all the standard operations including delete, shred, truncate, and vacuum, but it doesn't affect files deleted by third-party software (yum and apt). Files that are whitelisted are clearly marked in the BleachBit log. o Delete recent documents in GNOME 2.28 -- 2.30 (e.g., Ubuntu Karmic Kaola, Lucid Lynx, Fedora 13). 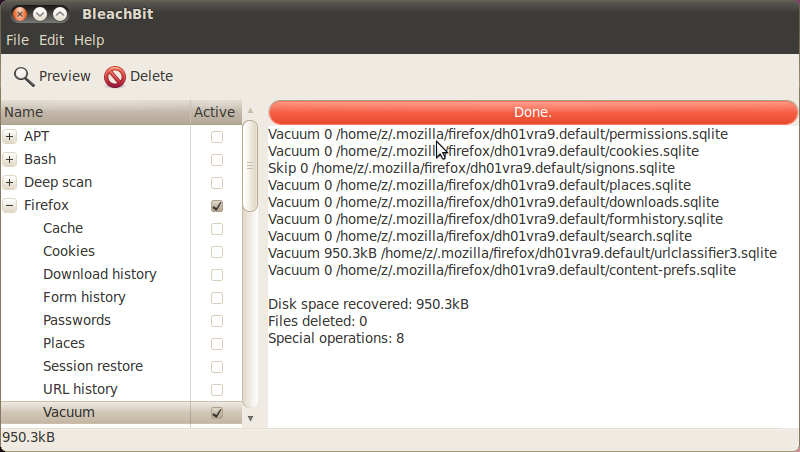 o Use GTK+ Recent Manager to purge recent documents list. o Support Thunderbird 3 as found on Ubuntu Lucid Lynx 10.04.
o Introduce .rpm package for Fedora 13 (Goddard). o Avoid triggering a false positive in BitDefender Antivirus 2010. Very nice app,using it since the first release and still the best for the purpose.